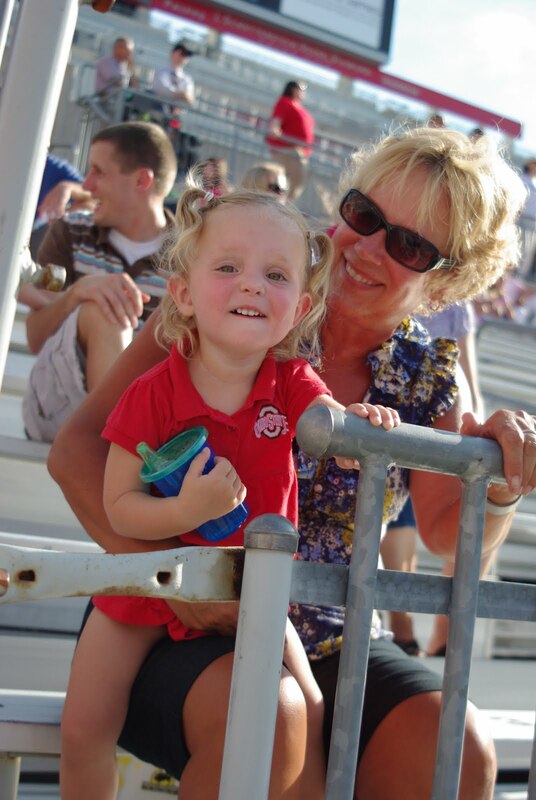 Proud to be a Buckeye MOM! We are 13+ years away from the day Henry will declare his commitment to The Ohio State University, accepting a full athletic scholarship, thankyouverymuch. And I imagine that will be one of my proudest days as a Buckeye mom. 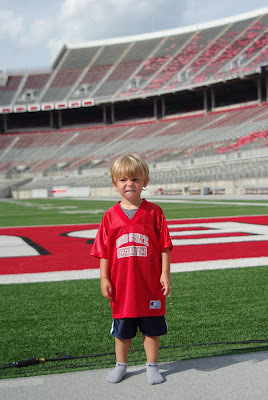 But even at 3 years old, my little Buckeye is already making his mother's scarlet and gray heart swell. For those of you who don't know, my incredible husband recently cycled 100 miles in the Pelotonia - an event that raised money for cancer research. 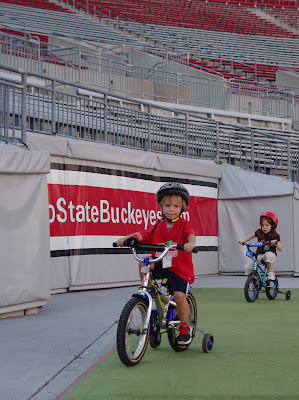 Matt was a member of Team Buckeye, and two weeks before the ride, Team Buckeye hosted a Biking with Brutus event at the Horseshoe. One end of the stadium was converted into a carnival with tons of activities for kids. The highlight of the evening was a bike ride for children, allowing the kids to ride the perimeter of the football field. 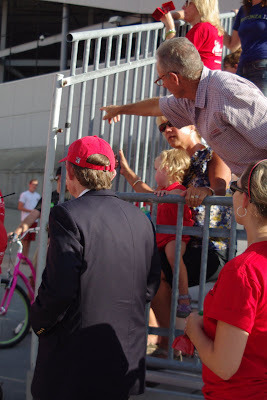 Present that evening were plenty of Buckeye All-Stars: Brutus, the cheerleaders, the pep band, Dr. Gordon Gee, and ARCHIE!!! 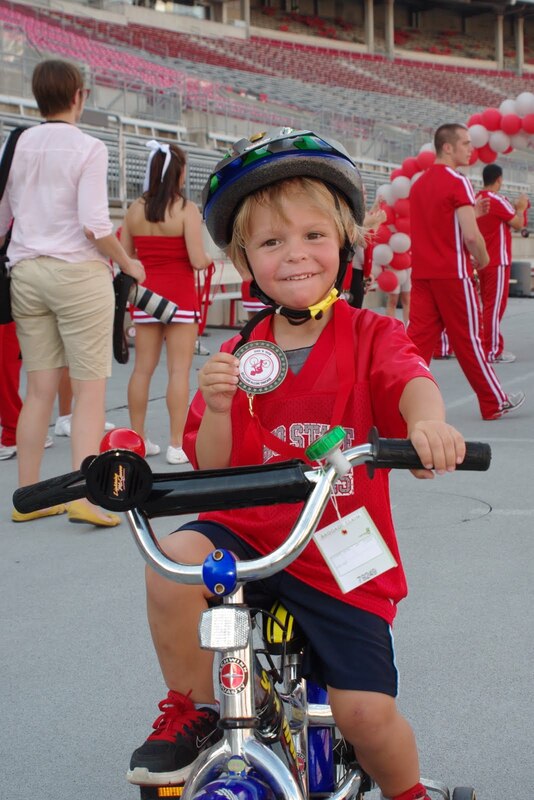 The event was only open to families of Team Buckeye, making for an intimate atmosphere. I tell you what, the riders had to raise a LOT of money for Pelotonia, but each rider committed $100 of their own to cover the cost of the ride (that allowed for all financial support raised to go directly to cancer research). The Team Buckeye event alone was worth the $100 - it was such a blast. Brutus & Henry - my heart skips a beat. 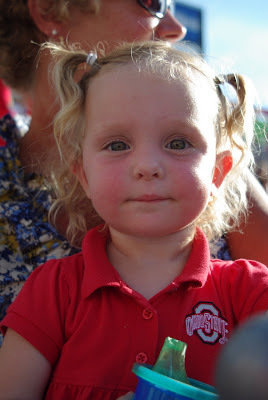 Though Harper loves Brutus, she was a bit skeptical of the live-and-in-person version. Oma & Opa joined us. Opa was also a member of Team Buckeye. Henry plays OSUMB daily. Lately he's been obsessed with the sousaphones. 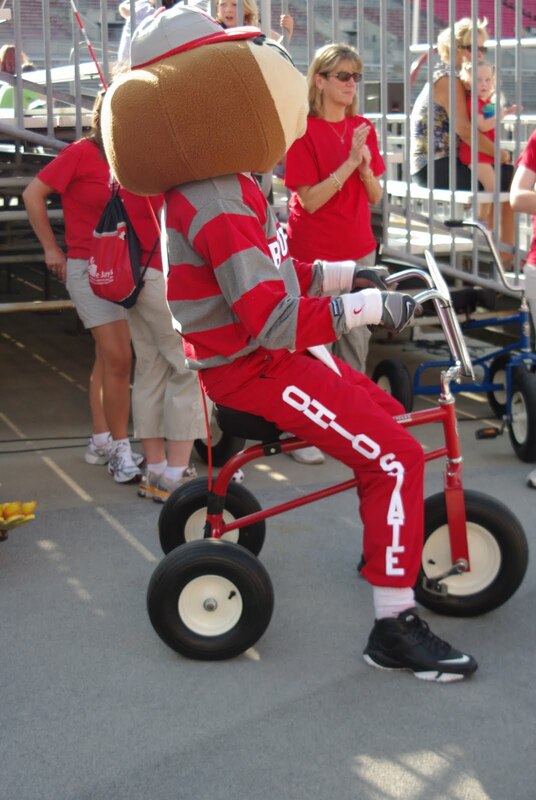 I tear up just thinking of him dotting the i.
Brutus, Archie and a few other characters rode on giant tricycles. 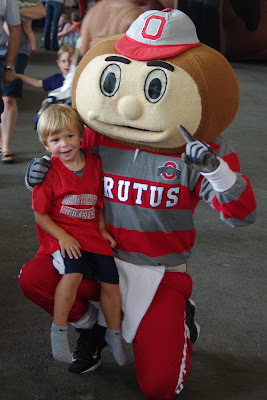 Brutus was such a good sport - slowing down so that each kid passed him. Henry still talks about how he beat Brutus in the race. Every good sporting event needs a cute cheerleader. Notice my Dad pointing? He's telling Dr. Gee, "That's my grandson!" Typical Henry, distracted by an airplane. You see a medal. I see a Heisman Trophy. By far the best picture of the evening. 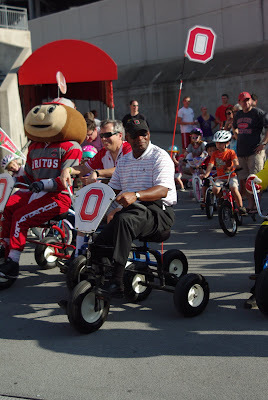 Even you freaks non-Buckeye fans can appreciate the awesomeness of this moment. Thank you, Team Buckeye! 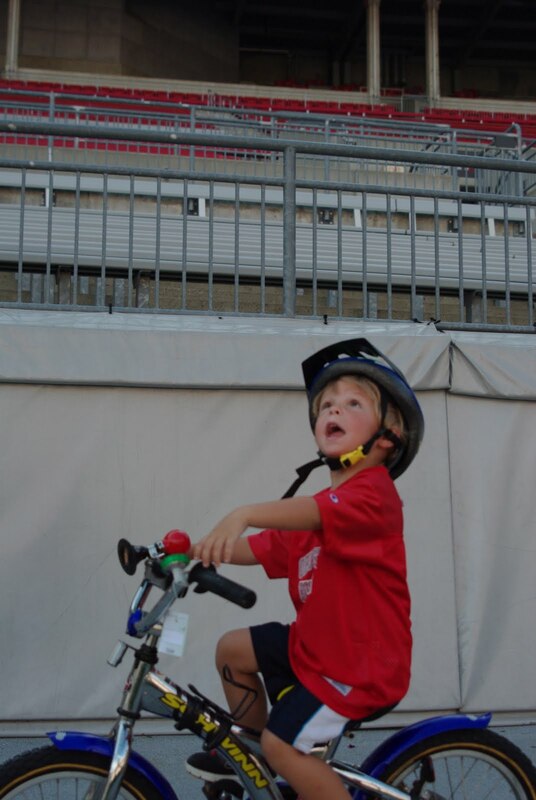 And thank you to all the Pelotonia riders. I adore you all for making such a commitment to eliminate this horrific disease.